I have the pleasure of announcing that the picture book “Della and Lila and the Treasure Adventure” has been published and is now available on Amazon. 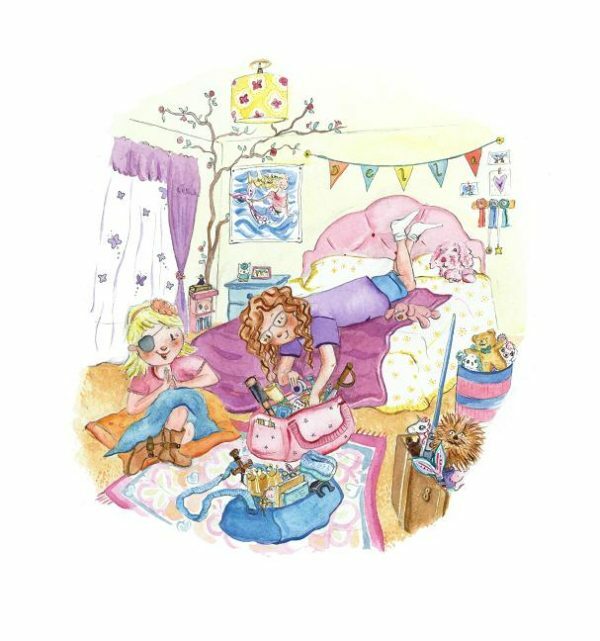 This is the second instalment in the Della and Lila book series, a commission which originally came through Hire an Illustrator, not long after I became a member. The beautiful Monongahela River, in southwestern Pennsylvania, provides the backdrop for this story with unexpected twists.This swashbuckling, adventure tale is rich with river pirates, mermaids, and local legends. After learning of their mother’s secret treasure map, Della and Lila set their heart’s course to discover buried treasure of their own. The girls gain many valuable lessons along the way. I feel very fortunate to be the illustrator for this series of books, and I have loved working closely with Brianne Mitchell in order to get lots of personal details into the illustrations. For example, developing characters from photos of real people and historical photos of family members, and in the process learning their stories. Also looking closely at photos of the landscape and trying to make it more authentic by adding in the kind of flowers and wildlife that might be in Brownsville at that particular time of year.